The oil cleansing method (OCM) is a simple cleansing of oil used on your face to clean and get rid of excess oil. This method is quite difficult to understand at first especially if you are dealing with an oily slick complexion now. Once you begin to understand the theory behind this easy skin care procedure, you will indeed want to at least try it. A simple explanation is, knowing that our skin needs some oil to keep healthy and lubricated. Our natural oils heal, protect, moisturize, and help your skin function properly. Too little, we often experience dry and flaky complexion problems. On the other hand, too much oil, creates oily, acne issues. Oil dissolves oil, so the purpose is to dissolve the imbedded sebum and eliminate the excess oil and create a balance for your skin. Want a more natural alternative? Do you find your face is constantly oily and shiny even hours after cleansing? The same holds true for your hair- Greasy hair that needs to be washed daily? Most commercial facial cleansers and shampoos are too harsh and strip our natural oils. Our skin, will automatically then try to repair itself. This results in our skin producing more oil to compensate for its lack of moisture. As the skin condition worsens, the endless cycle continues. Castor oil- It has healing, cleansing, and potent anti-inflammatory properties. It can also be quite drying. If using caster oil in your formula, use a high quality cold-pressed type and adjust percentage till you find a suitable level that works for your type. It’s all about customizing your personal blend that will work for you. 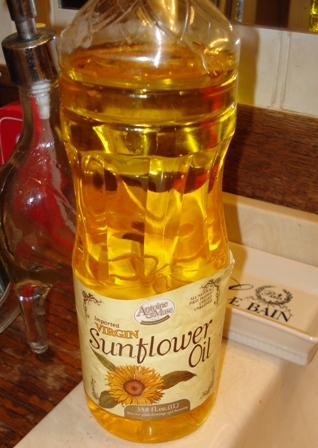 Tip: Sunflower or Extra Virgin Olive oil is great common used/ beginners choice to OCM. Start with a normal skin cleansing recipe and tweek it to your skin type, adding more castor oil (oily) or less caster oil to a dry/aging type.